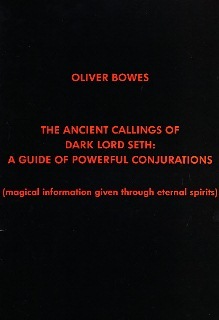 Author Oliver Bowes describes himself as a ‘grey magician’, believing that true power can only be attained by traversing the dark realms as well as the light. He has no fear of summoning dark forces, ‘and neither should you’, he says. None are darker than SETH (or ‘Set’), the original ancient Egyptian demon-god of destruction. Yet he not only accomplishes the magician'’s demonic will, but protects him too. THIS MANUAL OF STRANGE MAGICK SHOWS EXACTLY HOW TO SUMMON AND CONTROL THE DARK FORCES THAT CAN ACCOMPLISH THE MAGICIAN’S WILL. ‘These dark callings once set in motion are impossible to stop’, says the author. Think carefully before proceeding! Rituals include Invocation of the Almighty Seth and Revenge of the Black Cobra! As a grey magician Mr. Bowes not only knows the dark techniques, but also the light. Here there is also a ritual for cleansing the soul! No harm can befall those who make these callings, he says. The real enemy is ‘lack of knowledge’. With knowledge power is possible. This manual of diabolism is not recommended to a general readership, but only to those who feel ‘called’.